FACT: The world’s wealthiest investors have made BILLIONS by following THIS simple plan. little knowledge, and little effort. Money is the one domino that sets your greatest future in motion. The minute you become financially free, everything comes together in your life. It takes the weight of the world off your shoulders. Which makes you happier, more confident, and content. Which strengthens your marriage. Which alleviates your workload. Which allows you to spend more time focusing on your health, fitness, spirituality, friendships… everything. Sure, when you have money… you can get rid of your debt, spontaneously plan exotic vacations, and give piles of cash to charities. But it also “frees you up” to be the parent, spouse, business owner, manager, and PERSON you’ve always wanted to be. Unfortunately, to truly achieve “Financial Freedom” — always having the money for any want, need, or problem that arises — it takes a complex plan that demands lots of your time, lots of your effort, and lots of your money. Right? That’s the great illusion the financial industry wants you to believe. That it takes great time, complex strategies, superior financial knowledge, and most all of your reserve money. Then, you have to watch your investments like a hawk, continuously work to outsmart the system, and finally hold your breath in the hopes for a meager return. There’s a reason they make it more complicated than it needs to be. Stockbrokers, money managers, and financial advisors are in the knowledge business. They want you to line their pockets in exchange for their “expert” advice. They want you to believe that you must come to them to have any chance of financial gain. But it couldn’t be farther from the truth. The reality is that many of today’s most lucrative investors — billionaires such as Warren Buffett, and countless multimillionaires — follow a plan that’s incredibly simple. The smarter, easier, and more effective approach to reaching your financial dreams. And that’s the ONLY plan we’ve taught our many clients over the past 6 decades. Yes, I want to potentially add millions to my retirement starting with just $50 a month! I can ORDER NOW and SAVE $40! There’s no “wrong” age to start. So start TODAY... RISK FREE! Find out for yourself. Click on the link below and order How to Become Financially Free on $50 a Month right now. As always, our guarantee allows you to test this financial plan RISK FREE. If within 30 days, you’re not in a position to invest and grow your money, simply return this program for a FULL, no-questions-asked refund. 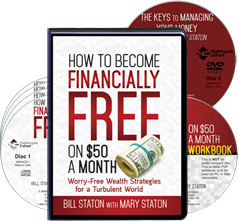 Please send me the complete How to Become Financially Free on $50 a Month program, including 4 CDs, a DVD, and the writable PDF workbook, for just $89.95 – which is $40 OFF the full retail price! GUARANTEE: If I don't begin to experience a new financial outlook in the next 30 days, I will return the program for a full refund. No questions asked. Bill Staton is a Chartered Financial Analyst (CFA®) with an MBA in finance from The Wharton School at the University of Pennsylvania and a bachelor’s degree in business administration from UNC-Chapel Hill. Bill is widely known as “America’s Money Coach®.” He has been Managing Director and Chief Investment Officer for Staton Financial Advisors, LLC, since its inception in 2000. He and his wife and partner Mary began portfolio management in 1997.